Ann Taylor does not want this tree to be cut down. 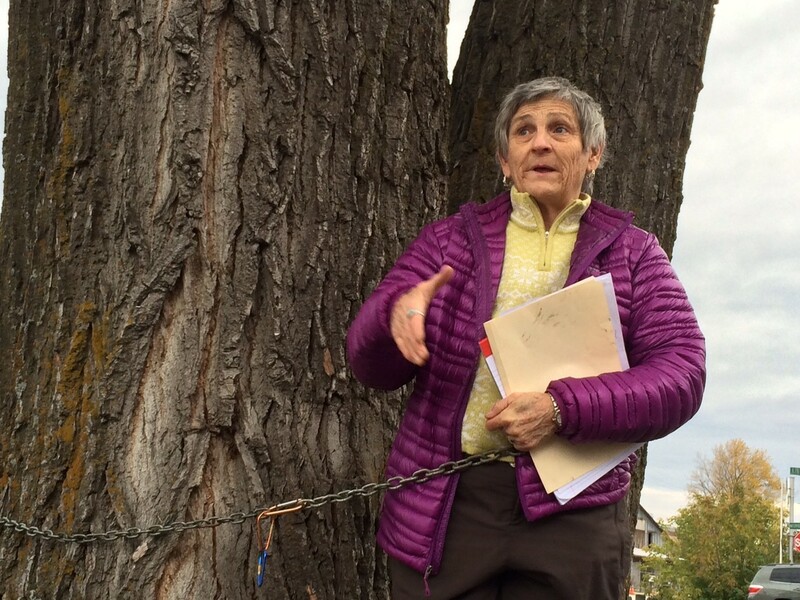 Ann Taylor of Burlington was chained to a massive cottonwood tree on the waterfront when she leaned forward and called out to a couple of bicyclists passing by on the bike path. "Hi! Do you like this tree? They're going to cut it down!" Taylor said she learned earlier this week that the tree, at the bottom of King Street, was to be taken down as part of a plan to improve the bike path. It's huge, with a massive trunk that splits into three as it climbs to a crown. So the physical therapist chained herself to it Wednesday afternoon — she said she'd stay a couple of hours — and tried to convince everyone who biked, walked or ran by to call the Burlington Mayor Miro Weinberger. "Are you local? Do you know this tree?" she would ask. Some stopped and leant her a sympathetic ear. "Call the mayor!" she shouted to a couple of bicyclists who didn't stop. "They're gonna chainsaw it down in a week!" Jesse Bridges, the city's director of parks and recreation, confirmed the tree is coming down. The city is widening the path, and it's in a narrow right-of-way by railroad tracks — so there's no room to move it. Cottonwoods damage paving, he said, and the pavement by the tree is in poor shape. "It's the wrong tree in the wrong place," he said. "We don't take these decisions lightly." News editor Matthew Roy has been at Seven Days since 2014. Before that, he was an editor at The Virginian-Pilot.